Thanks to Alan Tracey for these photographs from his recent trip to Chile. Adesmia is a genus of about 230 herbaceous and shrubby species native to the montane and alpine regions of South America. 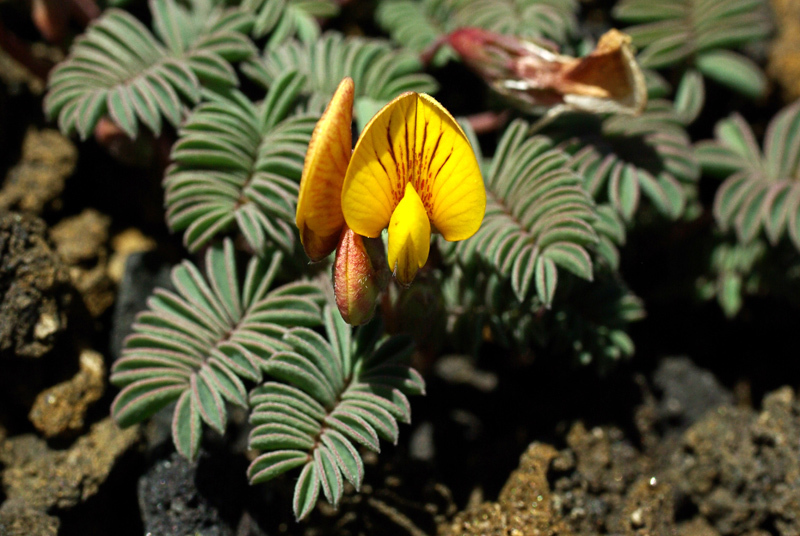 They have pinnately compound leaves, legumes covered with shaggy red hairs and classic papilionaceous flowers. The classic pea flower is composed of a broad, upright “banner” or “standard” petal, two side, “wing” petals and two lower petals partially fused together to form a “keel”. The keel encloses the stamens, which normally form a tube for part of their length (they are free in Adesmia) and surround the ovary and lower part of the style. The five petals are inserted inside the cup-shaped base of the calyx. Pollinators (probably bees in this case) are attracted to the nectar that forms in the cup at the base of the petals. To reach the nectar, they must stand on the keel, which deflects and splits open under the insect’s weight (but only when the anthers are ripe), tripping the stamens to fly up and deposit pollen on the insect’s body. Once the mechanism is tripped, the style, which is bundled with the stamens, is also forced into position to be brushed by foraging insects. However, peas are protandrous (proto = first + andro = male) and the female parts do not become receptive until after pollen is shed. Protandry, which is typical of bee-pollinated flowers, helps prevent self-pollination. Pollination takes place once the stigma (the pollen receptive surface at the tip of the style) is ripe, presuming the visiting insect is arriving already dusted with pollen from another flower. Adesmia longipes grows to about 10 cm tall in mid- to upper-montane areas of south central Chile (and is also found in Argentina). Plants are herbaceous and winter deciduous. The name Adesmia (a = without + desmos = a bond) refers to the stamens, which are not fused, as is the normal condition in this subfamily (Faboideae) and the specific epithet longipes means “long-stalked” (presumably in reference to the flower stems). The common name, pasto de guanaco, means “fodder of the guanaco”. The guanaco is a small llama relative native to the Altiplano of South America. Ooo,stunning textural contrast. Love it. But I was sure I would see a lichen today. Caloplaca obamae. Shows you how out of the loop I am, Meg. That would have been a good one — it’s not often that lichens appear in the news. Wonderful texture! Is this Fabaceae fragrant, by chance? Amazing that such a stylish plant can live in such a challenging environment. And thanks, Meg, for the heads up on C. obamae. I’m supposed to be an amateur lichenologist and this is the first I’ve heard of it. A lovely plant to say the least. When I first gazed upon the top pic, I said to myself that is a Snapdragon. Well I am 65 and still learning. Thanks for sharing these pics of our beautiful land. I know very little about Botanical names, but I do know what I like. I like those pics, I can tell you for sure. As usual, fascinating information, but am specially delighted with the second photo – texturally and by the brilliant colour. Thank you! 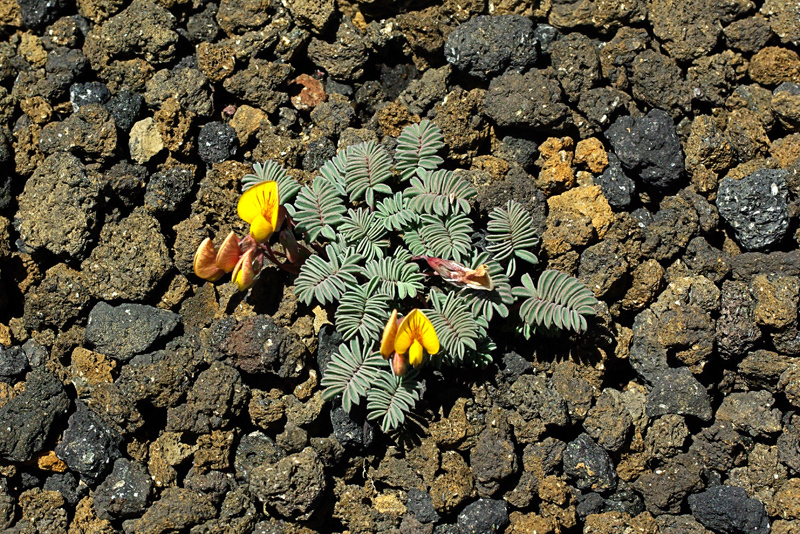 is this specimen growing on a cinder cone? a pioneer? So gorgeous, so contrast with the surroundings. Thanks for the detailed information and great pictures. Doesn`t the first picture remind you of an Egyptian bark in full royal regalia with all oars out behind? The follow up description was particularly articulate, thank-you. The postings are nearly as interesting as the plant. I love getting a daily missive of something new to learn.